The Torino is a Modern bathroom vanity set with a stylish tempered glass countertop and deep dish vessel sink. 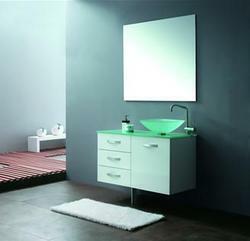 Contemporary bathroom vanity design with chic Italian character. Whether remodeling a guest bathroom or powder bathroom, this modern vanity design offers plenty of storage and space saving without compromising on style or practicality. Finely hand crafted from eco-friendly Solid Rubber Wood (from rubber tree) with a protective water-resistant finish. State-of-the-art silent drawer runners make drawer movement smooth and sturdy.